Heading to Oahu? Add these green initiatives to your itinerary at these hotels. Planting one of 3,000 milo trees. Forest for the Trees Thanks to guests at the Kahala Hotel and Resort, the discreet celebrity oasis five miles east of Waikiki, more than 3,000 milo trees have been planted at Gunstock Ranch on Oahu’s North Shore. Guests fund the reforestation initiative via an optional $8-a-day fee; they may also sponsor an entire tree for $60, in which case they receive a certificate and GPS coordinates to track its growth. Planting tours at Gunstock Ranch are also possible. Bottled Up No need to haul your Yeti water bottle with you to the Surfjack Hotel and Swim Club in Waikiki. Since last Earth Day, the oft-Instagrammed boutique hotel has provided refillable water bottles to guests and installed several “hydration stations,” rather than dispensing plastic bottles upon your arrival. The hotel estimates this step will prevent the creation of 75,000 pieces of single-use plastic per year. Guests can also take a Surfjack bottle home for $20; proceeds benefit the Kokua Hawaii Foundation, which supports environmental education statewide. Pedi Please Inside Waikiki’s elegant Halekulani Hotel, SpaHalekulani is not just the only spa in the world to offer the herbal-based organic products of JK7 Luxurious Natural Skin Care, developed on Oahu’s North Shore. It’s also the only spa in Hawaii to become a certified Green Circle Salon, employing a variety of environmentally friendly practices. So indulge in one of its Polynesian-inspired facials, hair therapies or spa mani-pedis in exceptionally good conscience. Enjoying the terrace at Waikiki’s SpaHalekulani. 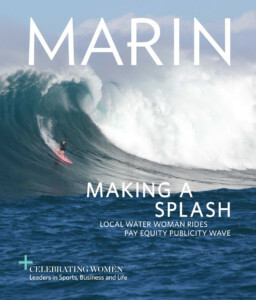 This article originally appeared in Marin Magazine's print edition with the headline: "Green Streak".